Sococo’s virtual office space helps co-workers “see” each other with simple icons. Is this just enough virtual reality to help your team? Sococo may be just enough virtual reality for organizations wanting to add another dimension to corporate collaboration–but not necessarily three dimensions. Looking like a buddy list presence icon with eyes and a headset, a Sococo icon moves around the floor plan of a virtual office space like a chess piece moving around the board. You enter and leave rooms to join and leave different meetings–where you are dictates who you can speak to through the integrated conference call system and who you can share your screen with. This is a less-literal representation of a virtual world than the 3-D model associated with game-like social environments like Second Life. Represented in the business world by products like Avaya web.alive, a 3-D virtual world has cartoon humans meeting in virtual rooms and sitting around virtual conference tables. Users navigate through 3-D worlds by making these puppets walk (or fly, or teleport) from one room to another. Sococo users can move to bigger or smaller rooms, depending on whether they’re holding a group meeting or a private conversation, but there is less stage business involved in getting from one point to another. Brody said Sococo instead aims for a user interface that is “immersive, but simplistic,” reducing the avatars to icons that provide clues to each user’s participation in an online meeting. 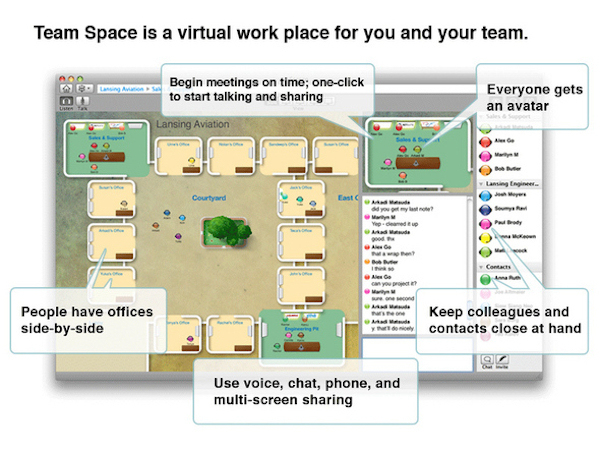 For example, an avatar wearing a headset represents someone participating via VoIP, an avatar with a phone to its ear is calling into the session, and one with its eyes open is paying attention to the screen-sharing portion of the meeting (as opposed to reading email in another window). Avatars also blink to show who is talking at any given moment. Sococo has been praised by tech evangelist Robert Scoble and featured in a video demonstration for TechWeb’s David Berlind at last November’s Enterprise 2.0 conference in Santa Clara, Calif. At June’s E2.0 event in Boston, the company added the ability to call out to phone numbers from a Sococo session, making it easier to involve participants who might not be at their desks. Sococo has won large enterprise customers, including financial services and consumer packaged goods firms, as well as many small businesses, Brody said. One reference customer who agreed to speak on the company’s behalf was Nick Weir, CEO of ChoozOn, a soon-to-launch consumer website for online deals and discounts. The company has 25 full-time employees working out of multiple offices in the United States and an equal number of consultants and contractors scattered around the world. He finds that Sococo has replaced a lot of collaboration sessions that were currently conducted in Skype because it goes beyond a simple buddy list representation of who is online. “Because you’re seeing the other users in a virtual environment, this lets you get a group together in small meetings on a very ad hoc and instantaneous basis,” he said. Web conferences also take less advance setup than if they were conducted using a tool like GoToMeeting or WebEx, he said. The Sococo avatars provide just enough of a visual representation to be useful, he said, whereas he suspects human figures dressed up in costumes would tend to be distracting when the team was trying to get work done. “I like how they’ve tried to keep the avatar representations a bit more abstract and not gimmicky. You can have them be different colors, which is just kind of a differentiation to help you tell them apart. But they’re just little balls, little bobbleheads,” Weir said.